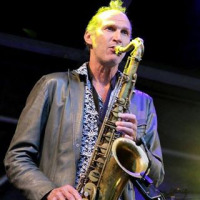 Ruud de Vries is a jazz tenor saxophonist from the Netherlands, playing and recording a lot of musical styles, though always based on improvisation. When you look up his recordings on Spotify, iTunes, Amazon, or all other online music portals, you'll find traditional jazz, funky jazz, souljazz, latinjazz, afrobeat, calypsojazz, rhythm & blues, rock 'n roll, pop and 'DJ' dance music with sax improvisation. Saxophone music without boundaries. Ruud de Vries bought his first saxophone when he was already 27 years old, after attending a performance of tenor saxophonist Hans Dulfer (the father of Candy Dulfer). He then knew he wanted to play the saxophone too. Not knowing anything about jazz and improvisation at that time didn't keep him from starting an instrumental band and perform right away. Ten years later he became a fulltime professional sax player after quitting his regular job. Ruud de Vries has recorded 7 albums, 4 single tracks, he played on 10 albums of other musicians and he contibuted to several dance music productions. The ballad album 'Moodprints' (2015) got the maximum of a 4 stars review in Holland's number 1 Jazz Magazine 'JAZZISM'. All About Jazz musician pages are maintained by musicians, publicists and trusted members like you. Interested? Tell us why you would like to improve the Ruud de Vries musician page.